Trinity Church existed before the town of Manchester came into being. 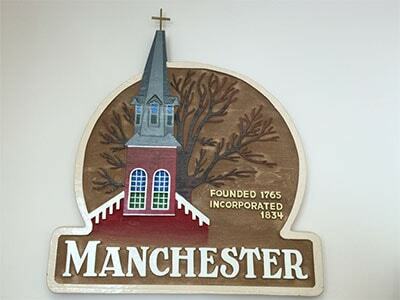 Its prominence in the community is signified by the fact that the church steeple appears on the town’s logo. Trinity Church has a long, rich history. In 1760, the Zion Union Church was formed. It consisted of two congregations, German Reformed, and Lutheran. Each group worshiped on alternate Sundays in the “Kirche Hausse.” As new immigrants arrived, the church membership grew, and the two congregations amicably separated in 1862. The Reformed Congregation became the Trinity Reformed Church, now known as the Trinity United Church of Christ. The present building was begun during the Civil War and completed in June of 1864. Located on the corners of York and Church Streets, the steeple is the highest point in Manchester. The 700-pound bell within the steeple was purchased at a cost of 55 cents a pound. It continues to summon people to worship each Sunday. Trinity Church has supported a number of ministries and local organizations over the years which have benefited our immediate community including NESAP (Northeast Social Action Program), Manchester’s National Night Out, and Food bags for Backpacks which provides food on a monthly basis for Manchester Elementary School students who could use a little extra help. Our congregation partnered with the town and Manchester Elementary School to install the first Little Free Library in Manchester. We are about to expand our presence in the community through a focus on improving literacy as the result of a grant award jointly to the church and the elementary school. 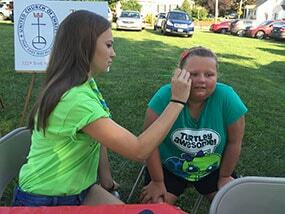 To learn more about our involvement in the community, see Outreach and Services. 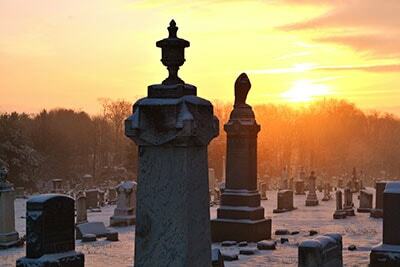 Although the land where our cemetery is located appears to be one large cemetery, it is composed of several cemeteries lying adjacent to one another and it is hard to determine where each cemetery starts and ends. The old Reformed cemetery extends somewhat north of the old oak tree to the sidewalks of York St. Slight pathways show delineations of sections. Section E, closest to York St., has approximately 575 inscriptions, and Section D lying opposite the church approximately 700 inscriptions.